For years, insurance agents, companies, and purchasers have looked at hypothetical ledgers that delineate future policy values in an attempt to articulate policy functionality and understand how one policy's features come together and work compared to another. Additionally, aggressive selling of policy projections overstated by extraordinary economic circumstances from the 1980s resulted in the industries obsession with hedging projections all in the name of full disclosure. As a result of this cautious approach to depicting future policy values, almost all insurers who issue whole life insurance policies provide options to reduce the dividend interest rate. Some look at this as a way to “stress test” a policy versus another and evaluate how each policy performs under declining economic circumstances. We figured, why not run our very own scenario with two major life insurers to highlight this practice and wander through it a bit more. We decided to compare the result of MassMutual's Legacy 100 Whole Life product against Penn Mutual's Versatile Choice Whole Life. These two companies have a well-established place as top contenders for cash accumulating whole life policies, and this gave us a chance to take a closer look at Penn Mutual's brand new whole life offering. We decided to evaluate the changes to the policies' projections under a 50 basis point reduction in the dividend interest rate, which is done by specifying this reduction in the proposal software that generates “illustrations” for each company. What follows is a chart that quickly summarizes the results over 50 years. 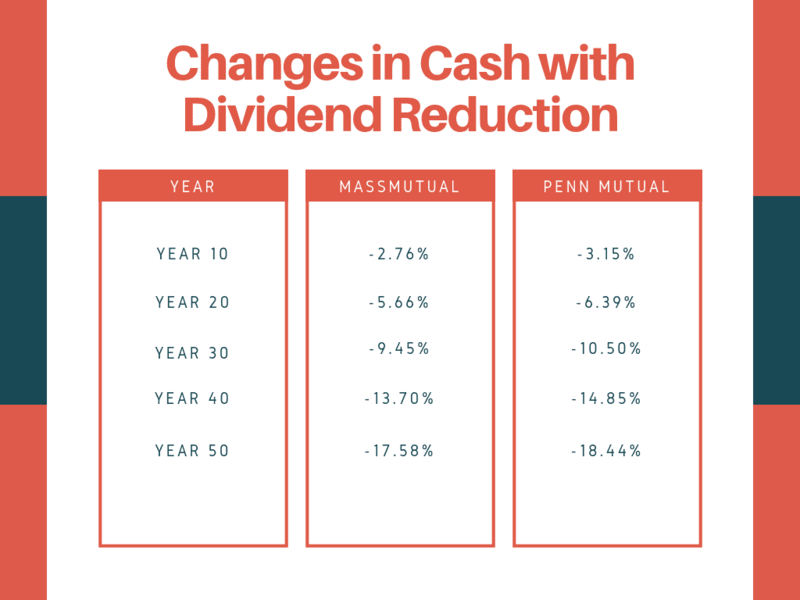 The results show us that despite the same 50 basis point reduction, there is a larger reduction in cash values at Penn Mutual than at MassMutual. 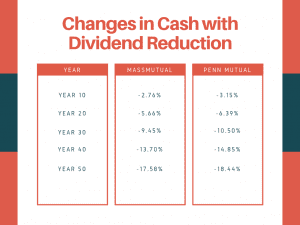 So we know, all other things being equal, a similar decrease in the dividend at Penn Mutual has a greater impact on future cash values than it does at MassMutual. This sort of analysis is rather easy to perform, fairly understandable by laypeople, and extremely useless. I admit it, this was a setup. But I had a point to get across so hopefully, you'll find forgiveness upon my explanation. First I'd like to clarify that I love data, and crunching lots of numbers to help direct decision making. The problem here is that we often times fixate on meaningless data because collectively we decided that it sounded sensible or–much worse–we came to a compromise. A lot of the alternative ledgers that we find in cash value life insurance proposals exists after a lot of fighting transpired over what should or shouldn't be shown to the purchasing public. Think back to the politic-ing that ensued leading up to the establishment of AG 49. Is the world a better place now that indexed universal life insurance assumptions are more realistic? Was there even much of an impact? Reducing dividend assumptions to try and determine which whole life product might be better off in tougher economic times is kind of like deflating the tires of two completely different cars to see which one gets better gas mileage. The dividend interest rate is one variable among several that come together to arrive at the total dividend paid to a policyholder of a participating life insurance policy. There's no universal standard for what is represents nor is there a universal standard for the equation that arrives at the dividend payment to each policyholder. So making an adjustment to this variable that could have a very different meaning at one company versus another tells us practically nothing about how the policies will behave in tougher economic conditions. Additionally, we can't ignore the fact that other variables might play a role in the dividend when those changing economic times come. Perhaps one company achieves a lower return on investments, and it does lower the dividend interest rate. But perhaps also this same company realizes an increasing underwriting profit and increases the portion of the dividend payment attributable to mortality experience. This means the reduction in the dividend could be far less than the interest rate reduction would suggest if there's a reduction at all. Finally, the coefficient to which the dividend interest rate applies (the policy reserve) can definitely vary from each company even for similar products. In other words, a 50 basis point reduction applied to a value of $150,000 doesn't produce the same result as a 50 basis point reduction applied to a value of $175,000 (assume the original dividend interest rates were the same and that no other variable was different…a fictitious assumption…by the way). There's also no standardization for making such reduction assumptions when projecting policy values. It's worth mentioning that I originally planned on making the above evaluation between MassMutual and Penn Mutual with a 25 basis point reduction, but had to change that because I forgot that MassMutual's lowest allowable reduction amount is 50 basis points. Not that MassMutual has a company policy disallowing dividend interest rate reduction of less than 50 basis points. There have certainly been changes to the dividend interest rate that were less than 50 basis points. We're no strangers to the arguments against the public use of dividend interest rates. We're not on board with complete removal of this information from the public sphere. We still find value in monitoring this data internally at each company to review how it changes over time. Sadly, however, the industry and many others have long confused this data point through its use as an analog to dividend yield or interest yields. We completely understand why some have made calls to remove this information from public consumption. When an insurance company tells you that they plan to pay policyholders X dividend representing a 6.18% dividend interest rate (a completely random number) that does not mean the company is telling you it plans to pay you 6.18% on your premiums, your cash value, or any other monetary figure you can glean from your policy report. It simply means that the insurer is planning on plugging 6.18% into the equation that it uses to determine what your specific dividend payment should be. There are several other variables that will also go into that same equation, none of which the life insurer has any intention of sharing with you. Is there any Point in Projecting Reduced Dividends? I caution to offer this up as a suggestion, but I can think of one scenario where it might make sense to evaluate a policy with a reduction to the dividend interest rate. If the scenario is heavily focused on the eventual use of the policy for income, there might exist reason to look at how much of a reduction the dividend interest rate can take before the projected income figures fall well below necessary income for the individual. This is not something I would look at when comparing to companies against each other (for all the reasons mentioned above). Instead, this is perhaps an evaluation used once settled on a specific company to determine if whole life insurance is the right tool for this purpose. Again I stress this comes with a host of caveats as actual changes to the dividend in future years may be more or less than projected by changing the dividend interest rate in illustration software. Brandon launched the Insurance Pro Blog in July of 2011 as a project to de-mystify the life insurance industry. Brandon was born in Northern New England, and he currently calls VT home. He attended Syracuse University and graduated with a triple major in Economics, Public Administration, and Political Science. Should I Buy Whole Life Insurance?